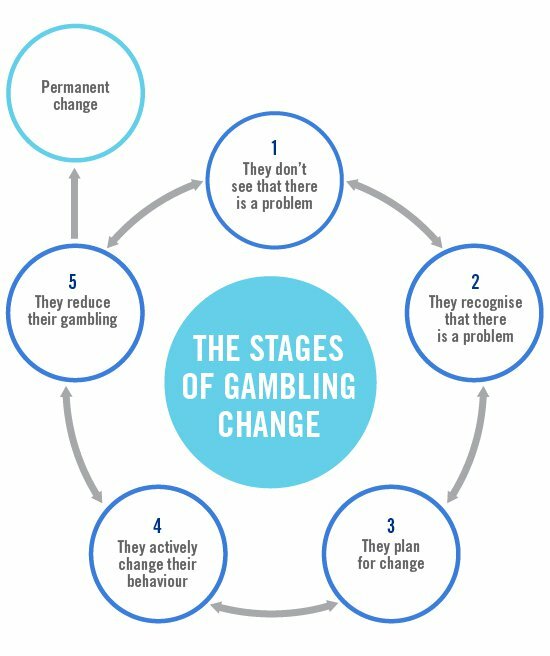 Anyone struggling with gambling problems goes through a number of stages of change. If you're supporting someone close to you with a gambling problem, it's useful to know where they are in the process of change. This can help you decide how to respond. get counselling and financial advice to help you best understand and manage the situation. try not to expect too much too soon as this may push them away. offer to attend counselling with them. if you feel comfortable, speak with them about your feelings. Otherwise, speak with a counsellor. Someone with a gambling problem may go through these five stages a number of times before stopping gambling permanently. If they fall back into gambling, it's important to understand this is a normal part of full recovery. Slips and relapses can highlight what triggers the gambling and help you work out new tactics to manage the triggers.